A Super Bowl in Minneapolis wouldn’t be a Super Bowl in Minneapolis without sound reporting from ThreeSixty students. Starting in September, a trifecta of ThreeSixty students and a young alumna descended on the big day’s supporting activities to give readers an inside look. After all, there’s more to the Super Bowl than the game itself, as student Loveisajoy Pha wrote in her profile of Super Bowl LII’s charitable giving and its leader, Dana Nelson. Pha’s story was published in the Dec. 2017 ThreeSixty Magazine. Student Zekriah Chaudhry shared a similar thought on his experience at the Super Bowl’s Kids Tailgate Party at Target Center. 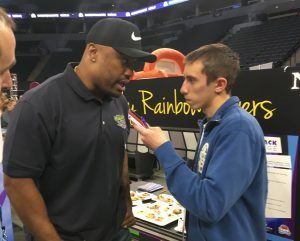 “Interviewing the mayor of my city [Minneapolis Mayor Jacob Frey] and one of the Vikings’ best players [defensive end Everson Griffen] in a span of about 15 minutes is about as amazing as it gets,” Chaudry said. Everson Griffen talks with Zekriah Chaudhry. From there, it was on to game day with 2016 ThreeSixty Scholar Danielle Wong. She covered the star-studded Power of Influence Awards Brunch. NFL Hall of Famers Ray Lewis and Randy Moss, as well as St. Paul Mayor Melvin Carter, were among the award recipients. Wong covered the red carpet and snagged an interview with comedian and actor Kevin Hart. “It was a fascinating experience to see the scene behind the red carpet and to humanize celebrities,” she said of her opportunity. Both Chaudry and Wong’s stories will appear in the April 2018 ThreeSixty Magazine.